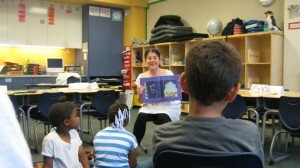 San Francisco BookPALS were approached to be “Mystery Readers” for the University of San Francisco Mo’MAGIC Summer Reading Program. 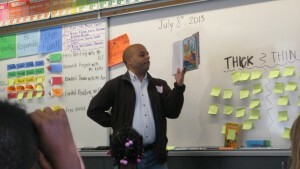 What BookPAL does NOT want to read to a special “mustery” guest reader to knock the socks off of a group of delighted young readers? BookPALS and Mo’MAGIC’s missions align perfectly — a common goal of helping students identify positively as readers, and to create a positive, voluntary, fun, safe atmosphere for reading. SAG Foundation BookPALS exist to stimulate children’s interest in books, motivate their desire to read, help develop reading and listening skills, and encourage their feelings of self-worth by giving them our time and attention. Special thanks to SF BOokPALS Cheryl Ann Belkin, Caron Beker, Gina Beretta, Duncan Fife, Malsolm Grissom, Roji Oyama and Nancy Sans who took time each week to be a special “mystery” reader to support the Mo’Magic Summer Reading Program.